All images on this site are copyrighted by Gene Levine, with all rights reserved. If you wish to use these works for anything other than your personal enjoyment, please feel free to e-mail me. Two of the basic elements of stereograms are texture and shape. It is both texture and shape that help the brain discern volume when we view the world. 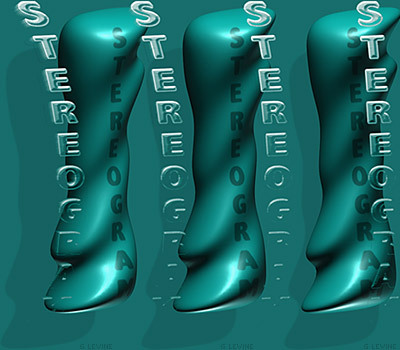 These stereogram images hold texture to a minimum—in some cases eliminating it altogether. What I've done with these stereograms is try and use subtle gradations in lieu of any textures. The results have been unique enough that I've created a separate gallery for them. I feel they create their own unique mood, much like New Age Ambient Music.